A 24-hour open bar, the Roots Rock Reggae Barn is a quirky place to get some drinks at. Its eclectic ambiance makes for a perfect environment to sip on some delicious cocktails. Good music and a very friendly staff are a plus point of this place. Live music is another noteworthy highlight of this place. It is frequented by several tourists who certainly keep coming back for more. Not to mention reggae lovers are ought to have a great time here, especially! Want to plan a DIY trip? Use Ao Nang trip planner for the same. Hotels like Haleeva Sunshine, Ibis Styles Krabi Ao Nang, Phu Pha Aonang Resort & Spa and Krabi Heritage Hotel will solve your problem of where to stay in Ao Nang. 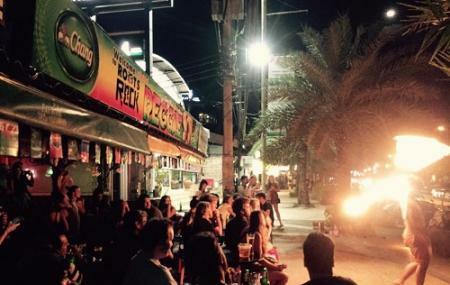 If you want to add the visit to Roots Rock Reggae Bar in your trip, you can choose from the variety of Ao Nang vacation packages that can be designed to suit your preferences. These packages also cover your major concern of how to reach Ao Nang. How popular is Roots Rock Reggae Bar? People normally club together Massaman and Mr. Long Bar while planning their visit to Roots Rock Reggae Bar. Love this bar, we went a few years back and since then it has relocated and it's for the better. Much nicer feel to the bar with great live music good deals on drinks. The toilets are a little grotty but after a few of their cocktails you don't care as the rest of the bar is so good.